In the first article of this series we covered how each type of wine requires a specific style of glass for serving. We also discussed that understanding the different types of wine glasses and what makes them ideal for one type of wine over another is essential to getting the most out of your wine collection. And, we also talked about what each part of the wine glass was for and the importance of it - such as the stem, the bowl and the rim. In today's article we will discuss the different wines and the recommended style of glass that it should be served in and the reasons. Red wines are made from "black" (red-colored) grapes fermented with the skin included. The skin is what imparts the red color to the wine. Red wines typically have a more robust flavor, and pair well with food that is similarly robust, such as red meats (beef, lamb), hearty pasta dishes, etc. They are usually drunk at or just below room temperature. 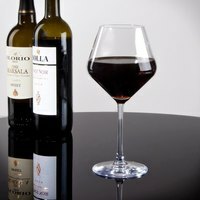 Red wines are best served in large wine glasses, like these red wine glasses. The bowls of these glasses will be fuller and rounder with a larger opening than other wine glasses of similar capacities in order to allow you to dip your nose into the glass to detect aroma. This bowl style is also imperative because the complex aromas and flavors of red wine demand a glass with a larger surface area to ensure that the wine comes in contact with more air. A specific type of red wine glass, the bordeaux glass, is taller than traditional red wine glasses, yet the bowl is not quite as large. It is designed for full bodied, heavier red wines such as Cabernets and Merlots. The tallness of the glass allows the wine to proceed directly to the back of the mouth to maximize its flavor. Another style of red wine glass, the burgandy glass, is designed for lighter, full-bodied wines such as Pinot Noir. 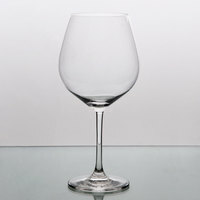 It is not as tall as the Bordeaux glass, but the bowl is larger than the Bordeaux glass, directing the wine to the tip of the tongue to taste its more delicate flavors. Rose wines are pink or blush-colored. The pink color comes from the fact that the grape skin is included for just the first few hours of the fermentation process, or sometimes due to the wine being a mixture of red and white wines. Most rose wines are medium-sweet, especially in the US, but some of the best European roses can be very dry. Two types of wine glasses are widely accepted for use with rose wines – stemmed glasses with a short bowl and a slight taper, and those with a short bowl and a slightly flared lip. Since these wines are fairly similar in fermentation process as white wines, the use of a white wine glass is also considered acceptable for these types of wine if a rose wine glass is not available. When selecting a rose wine glass, those with a slightly flared lip are usually preferred for wines that are younger, crisper, and less sweet than the more mature varieties. The flared lip design lets the wine run out of the bowl and right onto the tip of the tongue where the taste buds are most sensitive to sweetness. This allows whatever sweetness is in the wine to be enhanced, giving crisp wines a more balanced flavor and minimizing any bite. For rose wine that is mature and has a more full-bodied flavor, wine glasses that feature a slight taper are oft preferred. The bowl for mature rose wines is still short and rounded at the bottom, but shaped almost like a shortened red wine glass with a very slight taper.